The Rewinds emerged from the Birmingham, AL music scene with their creative blend of southern power pop. Focused on well-crafted songwriting and influenced by the likes of Paul Westerberg, Guided by Voices, Big Star, Sloan and Superdrag, The Rewinds bring brilliant melodies and hummable hooks with their supercharged live show infecting the audience with their rock and roll energy. The Rewinds originally began as a three piece consisting of Glenn Drennen on lead vocals and guitar, Chris Markham on bass and Brooks Marks on drums. After playing shows around the Southeast and recording a demo in Nashville, the trio realized their sound needed something more. The band decided to look for another guitar player to bring another creative influence to the table. At Markham's suggestion, they auditioned Michael Shackelford, a guitarist who was also moonlighting as a drummer in a local band. The audition went well and The Rewinds decided to add Shackelford to the line-up. In time, the band would discover he was quite a talented singer and songwriter in his own right. Drennen and Marks listened to a demo track (Sentimental Flaw) that Shackelford had presented to them. As both sat there listening to the track, they knew they had found what they were looking for. The Rewinds decided to move Shackelford to lead vocal and rhythm guitar and the band as they presently are began. It did not take long for this decision to yield results, as three months after forming the "new" Rewinds a record deal was on the table from Atlanta based Livewire Recordings. The Rewinds signed the deal and the band began to rehearse and perfect a tight live show. They rented a storage unit at Uncle Bob's in Birmingham and went to work practicing in a sweat soaked non air-conditioned unit playing regular weekend headlining slots and sharing the stage with acts such as My Morning Jacket, Verbena, Snow Patrol, Eisley, VHS or BETA and World Leader Pretend. 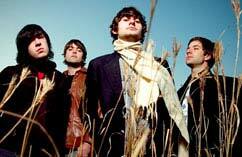 After several months of rehearsals and local live dates, the band was ready to record and set up shop in Atlanta in August 2005 to track what would become their debut album. Over a period of six months, the band tracked songs and made appearances performing at both the Atlantis and CMJ music conferences. The band and producer, Livewire Recordings' Colin Cobb (Junior Varsity, Ashton Allen), set out to capture the raw energy of their live show while at the same time create the necessary studio vibe to nail the songs on tape. Recording at Atlanta's Vintage Vide Studios, Colin and the band worked feverishly to make the record happen. In total, 25 songs were tracked during their sessions and after much deliberation the disc was narrowed down to 14 cuts. The end result leaves the listener with an intensely fresh rock debut that sounds importantly modern, built from a classic foundation.